“Tumhari Sulu” is the story of Sulochana Dubey aka Sulu (Vidya Balan), a middle class housewife with an indefatigable spirit who is in the constant pursuit of excelling and winning contests and competitions, which give her immense satisfaction. Perhaps subconsciously it stems from the fact that she is Class 12 fail as her banker sisters and father constantly remind her. Sulu as she is fondly called, is always eager to participate in contests and win — whether it is a night lamp or a pressure cooker. Her enthusiasm and confidence keep her going and her middle-class humdrum life does not deter her from giving these a shot. It is on one such occasion that she comes across the announcement for an RJ hunt and sets about pursuing it. How she becomes a popular RJ, on a night show, tastes success and yet, faces flak at home, forms the crux of this tale. Director Suresh Triveni manages to create the middle class milieu complete with Sulu, her husband Ashok (Manav Kaul), a Manager in a small-time mill and their 11-year-old son, Pranav, to perfection. Whether it is Ashok’s constant bickering with the TV company for having sold him a faulty piece and thus seeking replacement or Sulu’s family giving her advice to leave the RJ job at night, are all palpable instances that the audience can fully relate to. A performance oriented light-hearted film, the treatment in some parts however is a tad amateurish. While the first half establishes Sulu, her spirited personality and her secret longing to prove herself, the second half drags and at times lays undue emphasis on unnecessary trivia, which makes for tedious viewing. A lot of the situations seem forced and trite, as if to create some drama. 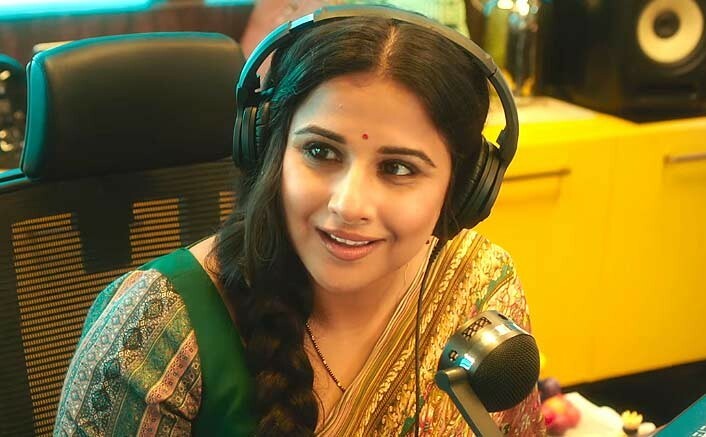 Vidya Balan shines as the effervescent, determined, yet vulnerable Sulu. She is endearing with her simplicity and innocence as a middle class housewife, who unabashedly asks for a TV instead of a pressure cooker as she has already got one. Ashok (Manav Kaul) excels as the loving husband, who willingly plays second fiddle to his wife, supporting her in her realising her dreams. A complete natural, he effortlessly slips into the role of a middle class husband and brings the right element of subtlety to his character. Neha Dhupia as Maria, the big boss of Radio Wow fits her role like a glove and delivers with the requisite confidence and panache. All other actors portray their roles with sincerity and shine on several occasions. The music of the film is melodious and “Ban Ja Tu Meri Rani” is sweet and well-picturised. It brings out the chemistry of the couple. The film has moderate production values but befitting the strata of society depicted. Nothing seems incongruous.